Virtual assistants like Alexa or Siri have become a part of our everyday lives. Their natural language processing abilities make it easy and intuitive to interact with them and use them as a user-friendly interface. And they are not just confined to our smartphones anymore, they are conquering our living rooms as voice-activated devices such as the Amazon Echo and Google Home smart speakers. But what about the workplace? It seems that here, too, virtual assistants have come to stay. 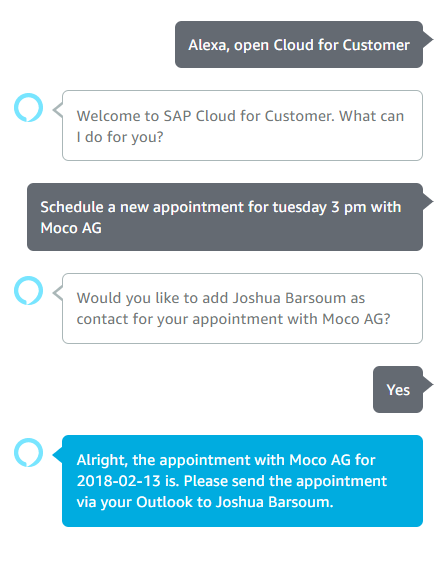 Just imagine you could just use your voice to start your SAP Hybris* Cloud for Customer (C4C), create a new visit, or add a note for an existing visit. This could save you a lot of time because you won’t have to sit in front of your computer and type away on your keyboard but could conveniently control you C4C even while on the go. In this blog article, I would like to illustrate the integration between Amazon’s virtual assistant Alexa and C4C on the example of visits. 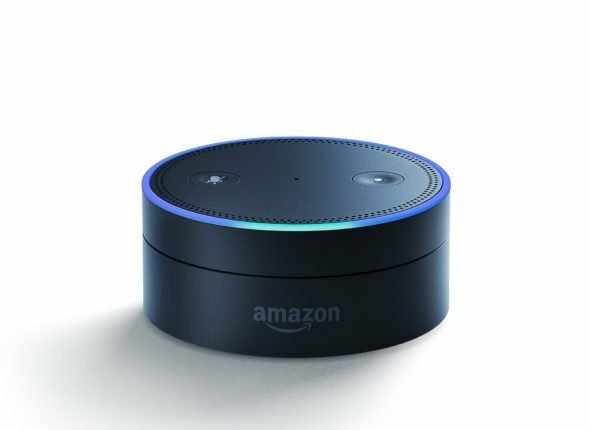 Alexa has a lot of built-in features such as “play music”, “forecast the weather”, or “create a to-do list”. But beyond that, developers can also use the Alexa Skills Kit to create new apps, that is, to teach her new “skills”. This means that in order to integrate C4C, we need to develop a new custom skill that adds C4C functionality to Alexa. This new skill can, for example, be hosted on the Cloud Foundry service for the SAP HANA Cloud Platform, which will also connect the application to C4C. In order for Alexa to know what skill the user wants her to activate, “invocation words” are defined to launch the corresponding app. In our case, “Cloud for Customer” is the obvious choice. A natural sentence such as “Alexa, open Cloud for Customer” or “Alexa, tell Cloud for Customer to …” will start the app. What is remarkable here is the fact that you communicate exclusively through voice commands. So using it while driving to a customer or working through your emails is not a problem anymore. The use cases “Create visit” and “Add notes” are just two ways in which we can use Alexa to collaborate with C4C. There are many other possible use cases that keep the number of user commands to a minimum. It can, for example, be very helpful to be reminded of upcoming appointments in C4C. The notification feature will notify you of upcoming appointments or other news that are of interest to you. You could, for example, say “Alexa, what did I miss?” or “Alexa, read my notifications.” to receive your latest notifications. You can also choose to disable notifications or switch to the “do not disturb” mode. Currently, this skill is only available as a developer preview but a release to the general public is scheduled for the coming months. The confidential treatment of business data is the primary concern and the virtual assistant provides multiple options to achieve this. One is to link the Alexa account and the SAP Cloud Platform account through the secure authorization protocol. 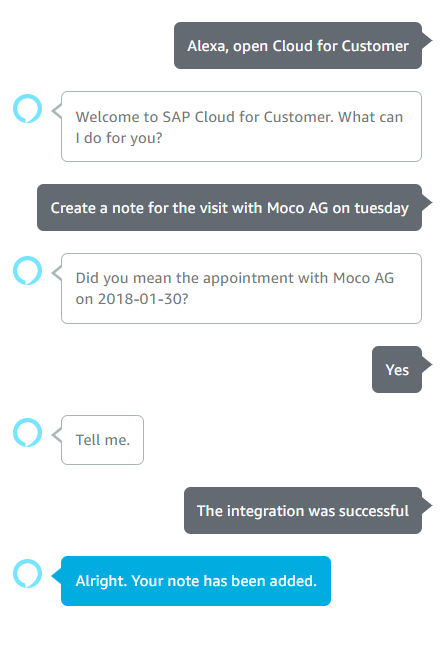 With it in place, the skill can only be used after you have authenticated yourself through the SAP Cloud Platform and authorized Alexa to access the required resources. And with the Alexa for Business service, you can make all of your skills completely private. Other than with public skills, which are available to everyone through Amazon’s Marketplace, this allows you to internally manage Alexa-enabled devices and develop and deploy private skills. To sum it all up, Alexa can not only lend a helping hand in your private life, she is also very useful in everyday business settings. The integration with C4C shows that it takes all but a few words to accelerate and simplify many of the daily tasks of employees working in the field. But Alexa is also capable of supporting a host of other features in C4C. And with the ability to link user accounts and deploy private skills your business data will remain safe and secure. As a technology pioneer in the voice-controlled operation of C4C, we are looking forward to keeping you updated on our latest innovations.